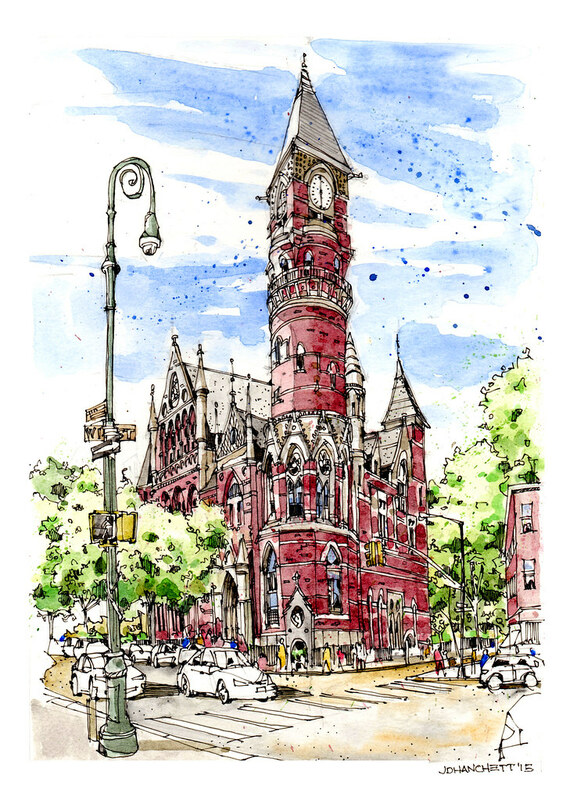 Situated on a triangle between West 10th Street and Greenwich and 6th Avenues, the Jefferson Market Library and Garden is an oasis in the middle of the city. The library, was originally a market place named for Thomas Jefferson and later became the NYC police headquarters. Deemed the 5th most beautiful building America in a 1885 survey of architects, the library is an ornamental brick building with catacombs below and a minaret that soars above 6th Avenue. Later the building became a courthouse with an adjacent jail. The garden, which was the site of the infamous Women's House of Detention, was created after the jail was torn down. Join us to capture the library from the street or with views from the garden. Bring a stool, some lunch (or purchase it from the many stores in the area) and your imagination as we sit on such an historic site. Extra Credit: anyone who would like to sketch the shortest street in NYC can visit Patchin Place on 10th Street, which also has great views of the library. NOTE; We will meet inside the garden entrance on 6th Avenue.